Dino Horizon 3D Stegosaurus Fossil Bones Skeleton Puzzle Toy. 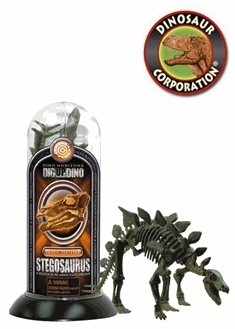 Encased in a test tube container, this Stegosaurus Jurassic dinosaur skeleton toy is fossil-textured for an amazing realistic look and feel. It's 7 inches (18 cm) and easily snaps together. Educational information about the dinosaur is included.